My name is Captain Nick Godwin, and I have a fishing addiction. Growing up in the country, I was a kid who naturally loved the outdoors. Whether it was chasing chipmunks around grandma's farm with my BB gun or catching frogs & grasshoppers to go fishing with. 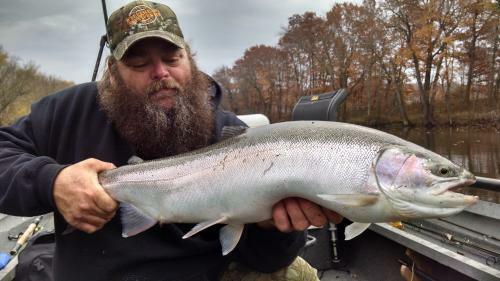 Fishing was always a passion of mine but Steelheading took it to an entirely different level. The passion soon turned into an obsession, which became an addiction. Which lead to the present and me being a licensed/insured fishing guide here in Michigan. Not only do I fish and guide for Steelhead I also love fishing and guiding for other species such as Bass, Musky, and even those tasty Panfish! We let the fish tell us how to fish. We aren't set on using any one method to catch the species we are after. Fall fishing is not far away! 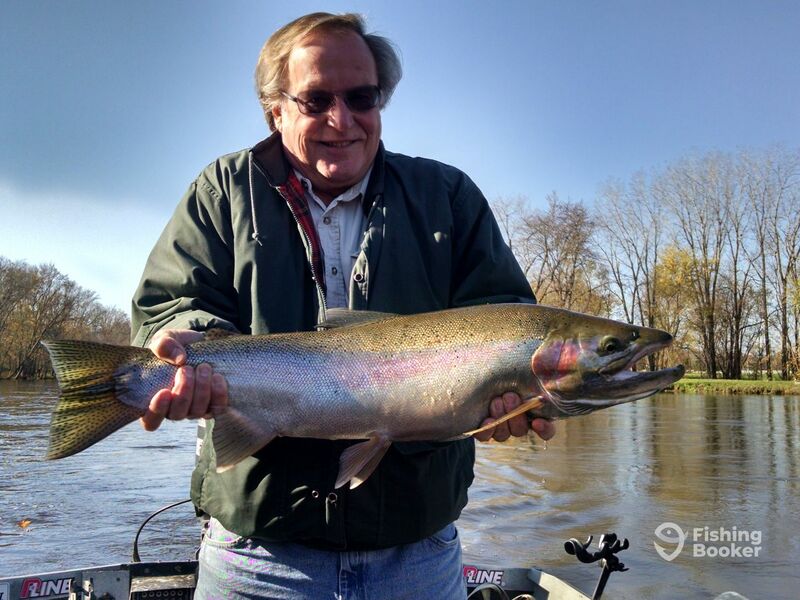 Steelhead fishing trip October 22, 2016. You would be hard pressed to find a Guide that would work any harder for you ! Nick is a heck of a guide and even better yet…a Great person. 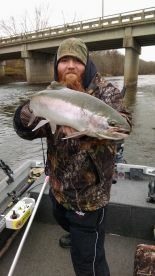 With tough conditions we still had a great day fishing. Nick will take his time and explain everything to you. He loves to share his knowledge. And the man knows how to fish. I have been out with Nick a couple of times now and I have learned something new every time. And I still call him if I have any questions on fishing or equipment, ect. He is always happy to help you out. The man is a master behind them oars working his plugs , if that is how you decide to fish. But Nick can fish however you would like. Whether it be casting spinners to float fishing, ect. I would recommend him to anyone looking for a great day of fishing on the water. Since meeting Nick and fishing with him a couple times. We have became pretty good friends. What more could you ask for out of a Guide like that ! Give A Grand Addiction Guide Service a try. I am sure you will leave there very satisfied and happy with Nick. Nick Godwin is the best!! . I’ve hired other guides, and looking back, I can now see they were obviously in it for the money. Nick is in it for the fish. More specifically, he’s in it for YOU to get fish. I’ll never hire anyone else. My advice to anyone reading this is to hire Nick for your next fishing trip. You won’t regret it!